EDAC personnel are expert in processing and analyzing a wide range of remotely acquired data. Aerial and satellite data from a variety of government and commercial systems are processed to inventory croplands, map vegetation­, and assess mineral and petroleum deposits, both nationally and internationally. 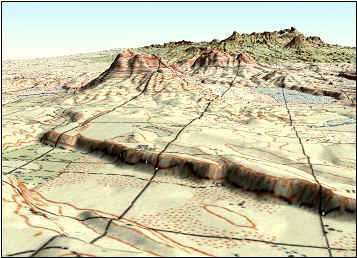 GPS and GIS technologies are often used in conjunction with imagery to model the landscape. Data visualization using imagery, elevation data, and vector coverages are becoming increasingly popular products for our clients. Our services are performed on a cost reimbursable basis. Projects are tailored to user needs and can include end-to-end processing, project design, interpretation, or delivery of an enhanced image for client interpretation. 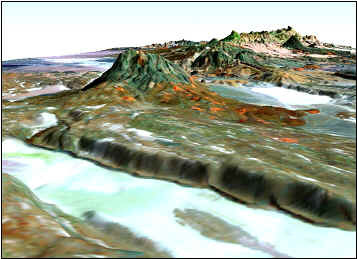 See the EDAC Image Processing/Remote Sensing Projects and Products pages for samples of our work. EDAC uses ERDAS IMAGINE software for all image processing projects and our hardware consists of a number of high end PC workstations. We have multiple IMAGINE licenses running IMAGINE Professional with the Vector Module as well as VirtualGIS. Our project range includes creating mosaics of satellite and aerial imagery, performing multispectral analyses for mineral exploration, mapping vegetation and land cover using GPS-derived spectral signatures, and generating digital orthophotographs. For more information please contact Paul Neville.